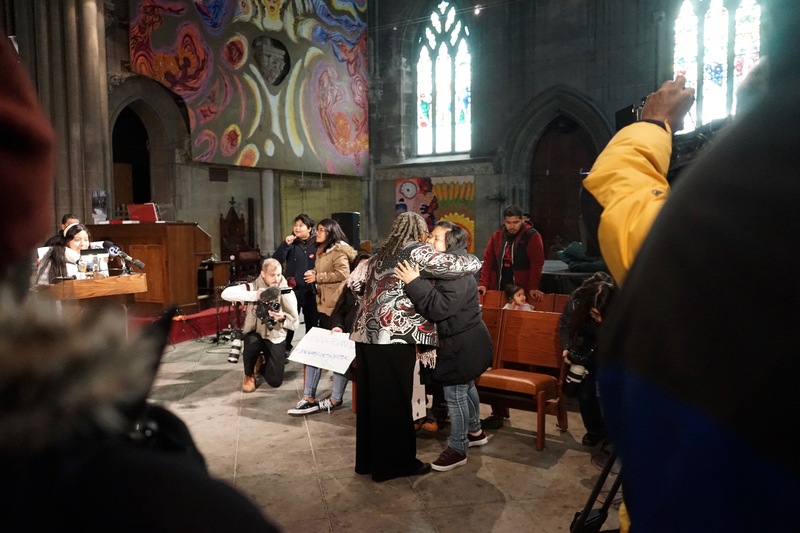 On December 13th 2017, Carmela, Fidel, Keyri, Yoselin, and Edwin entered sanctuary at Church of the Advocate, a member congregation of New Sanctuary Movement of Philadelphia. “I am taking Sanctuary to fight for my family, to protest our deportation orders and the injustices of the immigration systems. Everybody deserves to live with dignity and safety,” said Carmela. Sign the petition asking ICE to grant their asylum case! The Church of the Advocate is a place for radicals. No I am not saying that the Advocate is a place for extremist; This is a place that believes and knows and lives the simple truth that God calls us to love radically, serve radically and welcome radically. As Father Paul Washington said many years ago, this church lives the gospel of Jesus Christ. This means that for us action speaks louder than words. People are people. And love is the most important thing. That’s why we have invited Carmella and her family into sanctuary with us. Providing sanctuary is a central act of the church. It is opening the doors of our building and opening the doors of our heart to receive others in the spirit of the Lord. To protect, to nurture, and to emboldened people to claim their space, live their lives and speak their truth. Carmella is speaking her truth and it is our honor to stand along with her as she demonstrates courage; courage first in bringing her children to this country for safety from the reality of violence of which they are direct targets in Mexico. This was an act of courage but Carmella’s fight was not to end with this. After being denied asylum by ICE she determined that deportation back to Mexico was not an option. She wants for her children what each and every one of us wants for our children: we want our children to have the opportunity to grow into healthy adults with the capacity to fully embrace life. Her second act of courage and why we are here today is to demand that ICE allows her to pursue her petition for asylum in this country while she remains in this country. Deportation is not an option for this family. 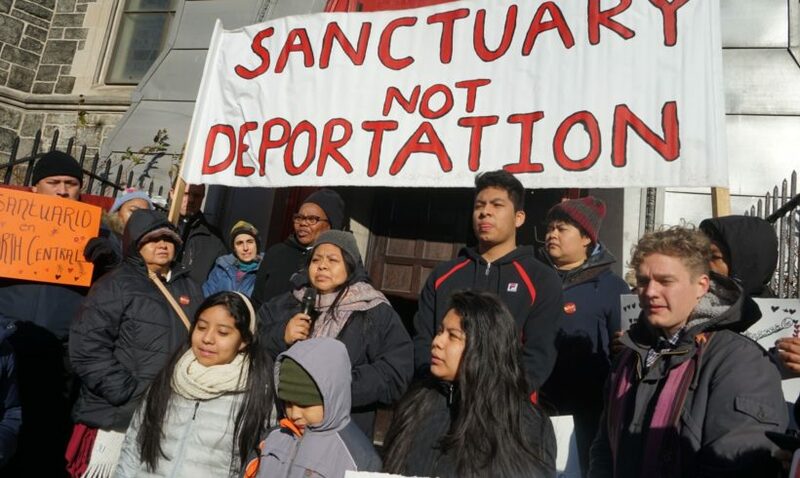 In this moment of standing solidly with people fighting deportation the Advocate just like other churches across this country can proclaim the good news: that the church is alive and well and living according to our call. The Advocate joined the New Sanctuary Movement earlier this year. One of the most rewarding things about being a part of this organization is the recognition of a shared humanity among people of color in a common fight. It is more important then ever that we stand together, that we struggle side-by-side; that we offer resistance while offering love. This is important because people of color together are on the margins of power in this country. I had a revelation recently that changed my thinking about the power of living on the margins. We often see those located away from the center as the ones with limited power to shape our own destiny, to claim our own position and to speak our own truth. To be on the margins was like being banished from the seat of action, to be on the periphery was to have to fight to do more than just watch and pray. The margins of society can actually point to something other than powerlessness for those who live there. The margins can become the center because being on the margin gives space for change to occur. To be in the center is to be landlocked where change is difficult because space is so restricted; trying to create change at the center would mean a massive dislocation of the others also crammed into that area, there is little room for growth and less space for new thinking. When you are at the center stretching out your arms always prove to be a challenge.But when you are on the margins one can stretch, one can push to create even more space. To be on the margins is to not be locked in but to have the space and the capacity to think and act in new and creative ways because creative change, radical, revolutionary change, happens from the margins. The margins can become the seat of power and when God places us in the margins to work or to live God is giving us the ability to create change. To live on the margin is to live in the place where one can witness the evolution of power. You cannot go wrong in creating and maintaining a welcoming place. There is no downside because the work itself of welcoming will not only lead to the reward but is itself the reward. We know that it is not just Carmella and her family who benefit from a place of sanctuary; we all benefit in some way. Regardless of color or ethnicity. Regardless of age and regardless of wealth. We benefit ourselves when we love radically. We benefit ourselves when stand for and with each other to fight for justice and a place at the table. The Advocate remains committed to clothing people for today and growing the spirits of people for tomorrow when we can all have a place at the table or until we will work to build a new table together. Let’s continue to build this new table together.